Claire Line is Learning Technologies Manager at global law firm Hogan Lovells and her session was about the journey the firm has taken to implement web conferencing and training online. Claire commented at the beginning of her session that she was going to be very open and honest about what she’s learnt. I thought this approach was quite fresh as so often things are wrapped up in a politically correct or HR way. We can’t learn if we can’t be honest. “There was no consistency to training across the globe when trainers would come in, deliver and leave” said Claire, explaining why web conferencing was implemented. 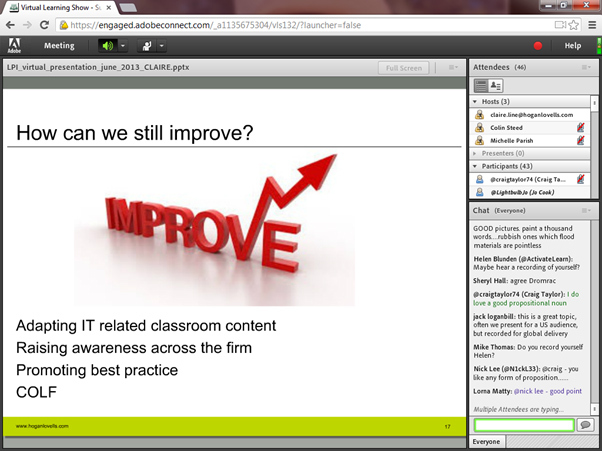 Claire posed the question “why are you implementing web conferencing? Budget, travel… what else?” of the audience. The answers included “reaching users, worldwide learners, no classroom available means no training, flexibility, just in time learning, speed”. The session went through a discussion about licencing and how this grew substantially across the company and then focused on the challenges. 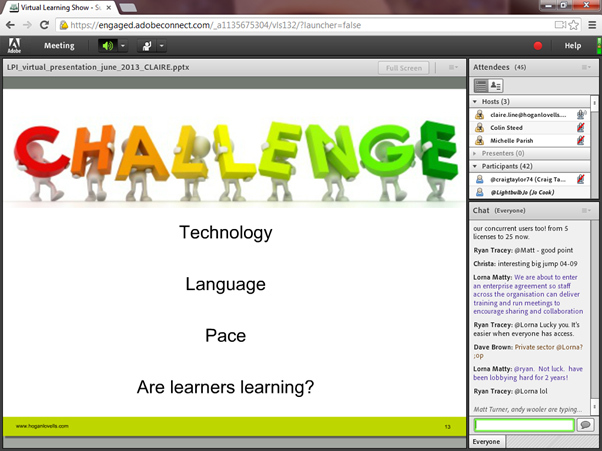 Claire commented “our first challenge was new technology. The biggest issue ten years or so ago was no guidance, tips, tricks or COLF in those days. Are the learners learning? This was another challenge. It’s easier in a face to face classroom. Online trainers felt they didn’t know if people were following along”. The audience were asked what challenges they faced in going online and the responses included “lack of equipment, attention of learners, language, fear of technology, connectivity, trainer’s reluctance”. Language across an international audience was an issue discussed. Claire asked “what advice do you have to simplify the language in your web conferences?” Answers from the audience included “pre-scripting, storyboarding, being mindful of what you say, use emoticons to gauge understanding, good pictures”. Claire moved on to talking about what is still being improved at Hogan Lovells. One issue was about adapting classroom to online content. Other improvements included promoting web conferencing across the international firm and best practice for online work. I love that part of Claire’s work is to evangelise – I think it’s probably part of something we all have to do!